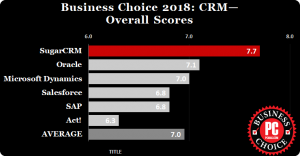 SugarCRM developed a different business plan compared to others CRM software companies. Its aim is to compete with top vendors in the CRM market such as SalesForce and Microsoft, so it has a different vision: it points to the customer service and it’s succeeding doing that. According to PC Mag’s 2018 CRM Report SugarCRM scored 7.7 in overall satisfaction. While other Open Source companies works mainly on adding new functionalities to their product and to fix highlighted bugs, SugarCRM focused on integration with platforms like Microsoft IIS or IBM DB2 that are closed but well known and already in use in thousands of business instances. SugarCRM is preparing itself to be the next leader in the CRM world and with the right accent on security there’s no reason why this should happen.